Graduated from Wrocław Medical University in 1982. Employed at the Limb Replantation Centre and Surgery Department in Trzebnica from 1982 to 1991. Worked with general surgery, traumatic surgery, hand surgery and microsurgery. 1st and 2nd degree specialization in General Surgery. From 1991 employed at the Plastic Surgery Department of the Regional Railway Service Hospital in Wrocław. Received 2nd degree specialization in Plastic and Reconstructive Surgery in 1994. Performed numerous surgeries with particular emphasis on breast reconstruction, neck and head surgery and microsurgery. 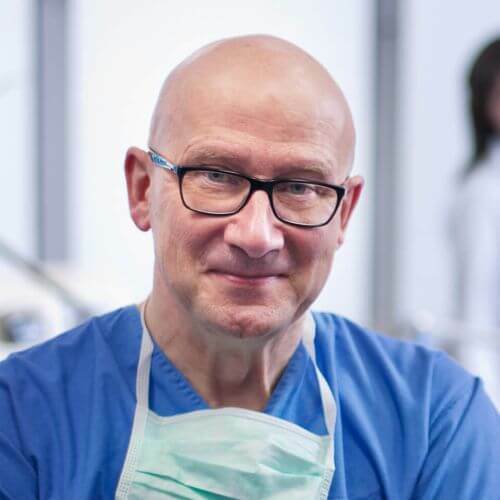 Active member of Polish Association of Plastic, Reconstructive and Aesthetic Surgery. From 1993 to 1995 held the position of the secretary of the Association. Numerous articles in brand magazines and over 20 lectures during Polish and international plastic surgeons congresses. From November 2003 member of the Board of Polish Association of Plastic, Reconstructive and Aesthetic Surgery. From April 2004 Head of Plastic and Reconstructive Surgery Department at Railway Service Hospital in Wrocław. From October 2005 Vice-President of Polish Association of Plastic, Reconstructive and Aesthetic Surgery. Since November 2006 Regional Consultant in plastic surgery for the Dolnośląskie voivodship.